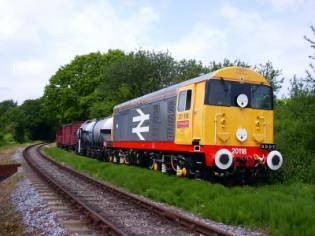 Was used on Friday 6th & Saturday 7th May for the Devon Diesel Society’s AGM and press day to celebrate 37037’s return to service in its new blue livery. On the Friday the loco worked with the 37 to Totnes, then returned as far as Staverton where it worked a short goods to Buckfastleigh. On the Saturday the loco was meant to work two trips in the evening (one with the 37) but due to steam loco 5526 failing at Staverton with a pony truck fault the loco had to stand in on the service train. Then on the Sunday the loco had its two CO 2 fire bottles removed, but to keep the loco in service two of the three fire bottles from 25901 (which were returned all serviced & refilled that week) put back into the loco. 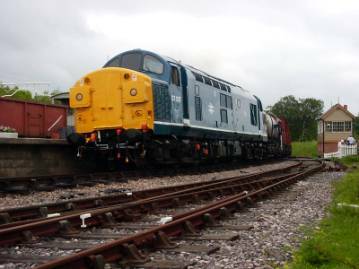 A day of shunting on Friday 27th May and a trip to Staverton to form the goods for the weekend, also to sort out stock for Saturdays “The Dart Valley Growler”. The cab has had a quick make over with a fresh coat of cream paint. Over the gala weekend the loco ran about 106 miles. 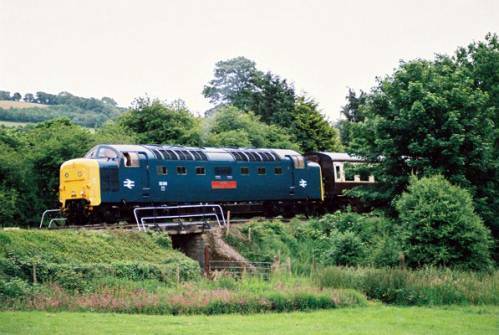 On the Monday after the gala the loco returned the DMU to Staverton. Then on Monday 20th both 20’s were used in top & tail mode on a train chartered by the Plymouth Railway Circle. The leak over the electrical cubicle has been repaired by the end of April. 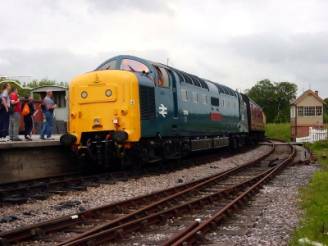 On Saturday 7th May the loco stood in for 110 on the special for the D.D.S. working one round trip. On Sunday 9th May the loco had its two CO 2 fire bottles removed so they can be sent away, along with the two from 110 for servicing and refilling. Extra hand held extinguishers were placed inside the loco so it could still be used. The loco (along with 110) had the axle box oil and traction motor gear grease checked & topped. The Co2 fire bottles were placed back in the loco just before the gala weekend. The loco also had its load regulator switches adjusted, which seemed to make the power control a lot better and improve the wheel slipping. Over the gala weekend the loco ran about 103 Miles. 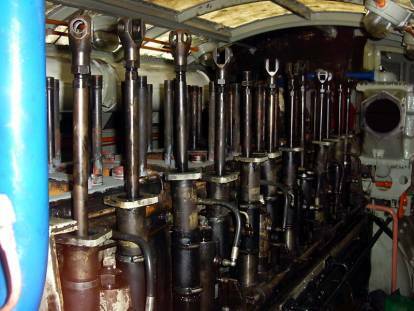 Sunday 3rd April saw the last three pistons, cylinder liners plus the three Co2 fire bottles all removed from the engine room. The fire bottle are to be sent away for testing and then refilling as it’s been well over 20 years since these have been inspected. The first three cylinder liner were pressed back into the block on Monday 18th and the last three were pressed back in on Tuesday 26th April. It was hoped that the pistons would be back in by now, but we are still waiting on a piston ring compressor to arrive. 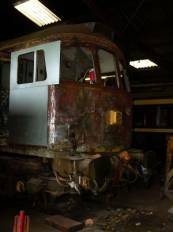 The loco was placed under cover in the running/stock shed in mid April so the body repairs could start. On Sunday 17th the radiator grills were removed and the fiber glass around both cab ends was taken off to revealed one mass of rust and a few holes. 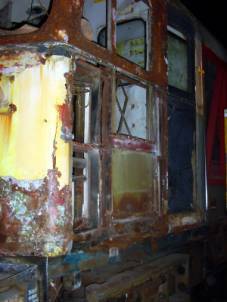 On Sunday 24th the No.1 cab had the windows surrounds removed along with the route indicator, AWS change switch and both side panels. 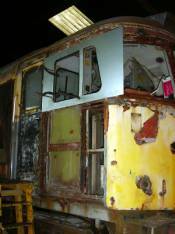 The drivers, route indicator and the two small side windows were also removed. By the start of June the rest of what was left in the cab had been striped out and work had started on cutting out the old bodywork on the drivers side. This was quickly followed by the secondmans side, was saw the first new metal. The Sunday after the gala weekend had all the paint and filler removed from the front of the loco. The welder (Dave) has now decided to renew the entire cab front. 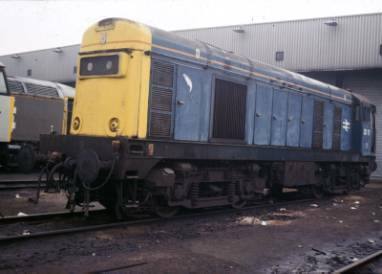 The loco was placed at the back of the running/stock shed after the class 37 came out, for the repair work to start on the air valve and the seal on the fluid flywheel to be renewed. In the end, after removing the exhauster and small shaft a problem arose in removing part of the flywheel. So, a new copper seal was fitted to the filler plug in the hope this was the cause. It was not, as oil was still being lost around the engine compartment. The loco was started up on Sunday 22nd May for the first time this year. Although the engine started, the batteries are starting to show their age and some may need to be changed soon. The loco has departed on Wednesday 13th April for the Peak Railway. We wish them all the best! After it’s repaint into ‘Gibson Improved British Railways Green’ the loco had its finishing touches applied on Sunday 3rd April. This being the numbers, Scotty dog, data panel and the white strip which it carried for a short while in BR days. The loco work the two days for the society’s AGM & press Friday 6th & Saturday 7th May, but on the Sunday an attempt to start the loco failed and had to be put on charged for an hour or so before it started! New batteries please? 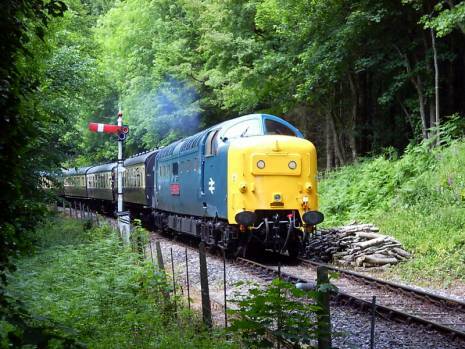 Saturday 28th May had the loco do seven round trips of the branch with “The Dart Valley Growler” charter. Then the week before the gala the new batteries arrived and were fitted. 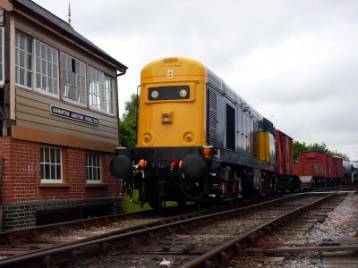 It was too have had one side and one cab repainted for the Diesel Gala, but time ran out! So a quick rub over with oil made the loco the some what better. The unit had the old wheel sets replaced through April. 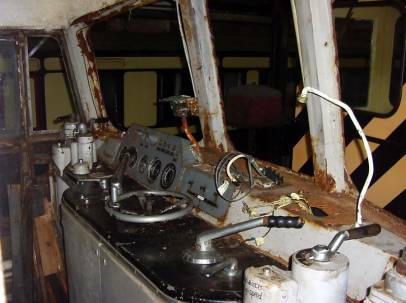 Work has been on going in the large saloon as well as the cab (brake van end). The unit, work five round trips for the owning group on Thursday 21st April. Used over the gala weekend, but only dragged around! Was noted running one day over the gala weekend. It would appear the oil radiator has been replaced! 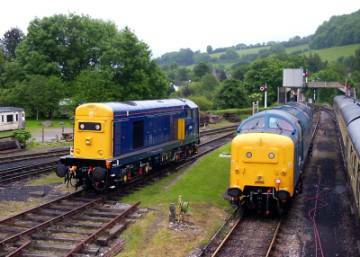 The three visiting loco’s arrived on time at Totnes at 20.11, with 47150 in charge of the move from Barrow Hill. 47150 was not used over the weekend, staying on the main line connection ready for the return back to Barrow Hill on Monday morning at 07.30. On the Saturday a goods train was placed on the loco making it look as if it was waiting the signal for a trip to Plymouth! The locos departed 07.00 on the Monday morning for Barrow Hill. Arriving two hours late after being held up around Oxford. 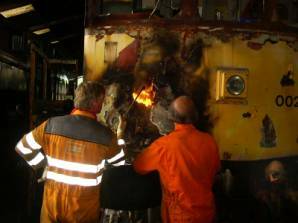 (20066)20905 – Due to three axle boxes being found to be in need of repair this loco was replaced by 20905 . As this loco is air braked only it was paired up the other loco’s to works passenger, but managed to work on it’s own for the odd freight working. 20096 – This loco worked on it’s own as well as being paired up with other loco’s over the two days. 55019 – Working on one lung (engine) for the weekend, Royal Highland Fusilier was the first member of the east coast express passenger loco’s to work the branch. It’s first working on the Saturday was light diesel to Bishops Bridge to work ECS to Totnes, but when it was time to depart Bishops Bridge a power problem was experienced. This was put right by the onboard fitter (a sticky relay was found) in about 15 minutes. Apart for this all three loco’s worked without fault for the two days. 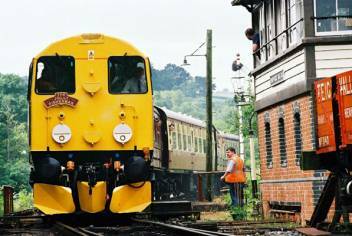 November Diesel Gala 5th & 6th. Sundays – July 3rd, August 7th, September 4th & October 2nd. 26th, 28th – 31st, October 1st – 4th. 20171 Seen outside Toton TMD three days after being withdrawn, on 11-12-89 with it’s leaping salmon. The loco was cut up at M.C. 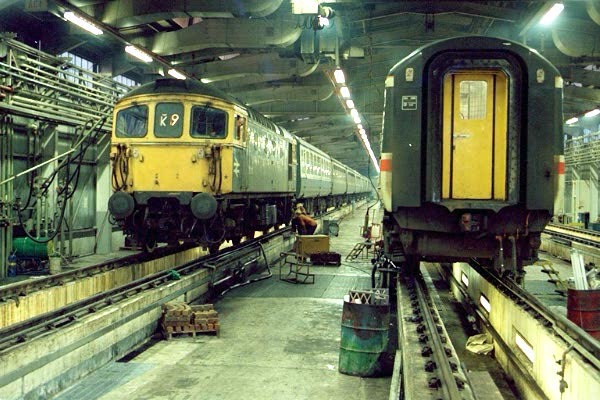 Metals in Glasgow at the start of August 1991, but the cab lingered on till November 93. 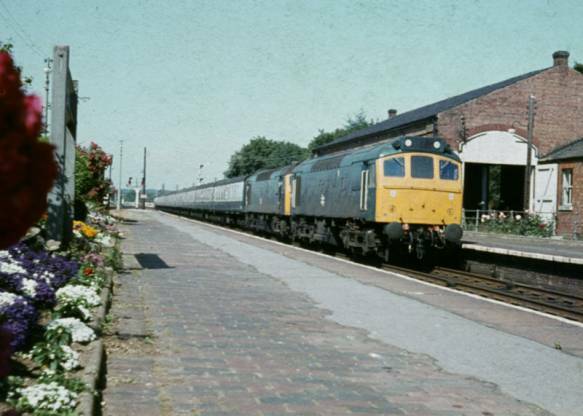 Our own 25262 with 305 seen passing Sleaford with a Shrewsbury to Skegness train on 1-8-77. 25305 Later became “ETHEL 2” 97251 for train heating in mid-1983. M.C. Metals of Glasgow cut it up late August 1994, but one cab has been saved and can be seen at Adswood Railway Museum, Crossbridge, Stockport. 11-4-86. This loco suffered cab and sub-frame damage after a smash at Salisbury on 7-10-88, it was broken up by Coopers Metals at Eastleigh East Yard mid-September 1992. 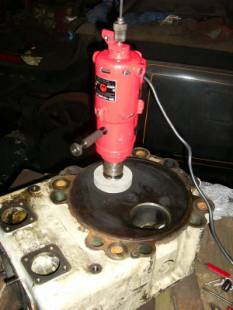 The power unit with all heads & liners removed and right the valve seat grinding tool in place. 33002’s No.1 cab partly stripped out and the drives side cut away. The first new metal going into the secondmans side on 11-6-05, then by Sunday 19-6-05 no paint. 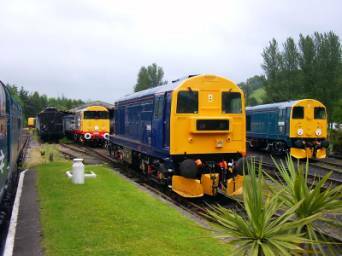 Before the start of day on the Saturday with 20905 & 55019 and four class 20’s in view. 55019 Approaching Bishops Bridge with an up train. While 20096 departs with a down train. Waiting in the loop spur at Bishops Bridge is 20118 the freight. And a Jolly Fisherman departs 20096. 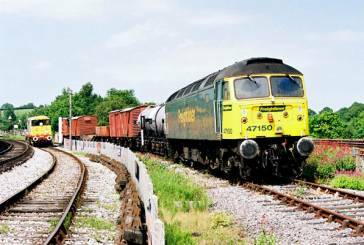 Freight trains at Totnes. With 20905 departing and 37037 arriving. 55019 arrives at Totnes for the first time and 47150 waits to depart for Plymouth! Both 11-6-50. 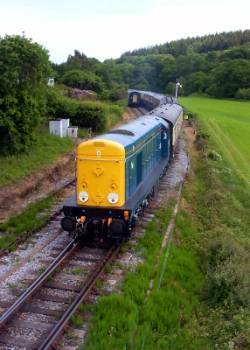 Arriving back at Buckfastleigh on the Saturday evening is 55019.